Bill Bloom, Medipacs® advisor, developer of MiniMed infusion pumps and co-founder of CardioNet®. The Medipacs® polymer is a unique technology which can be utilized as a source of inexpensive mechanical force. In an ionic solution, this polymer absorbs or expels free ions. 1) The polymer chains expand due to both hydration and the absorption of free ion components. The growth of the polymer can be controlled using either a chemical or electrical method: Either method can be effective in producing contraction or expansion of the polymer. > The chemical catalyst involves the addition of an acidic fluid to the solution. > The electrical implementation uses principles of electrolysis to produce free electrons in the solution. This controlled expansion can be used to expel drug from a container. > Cost – compared to the high cost of pumps currently on the market which utilize a motor and complex componentry, the Medipacs polymer in the pump with a solid state actuator is a fraction of the cost yet will produce a comparable level of power. > Energy Requirements – the energy required to operate the polymer is very small compared to other technologies used for displacement of a load or more complicated mechanisms such as a peristaltic fluid pump. The energy required to operate the Mini-Infuser is the equivalent to a small cell battery. > Volume Range —The polymer is as effective accommodating large volumes (hundreds of milliliters of fluid) to that of the smallest volumes (microliters). > Cyclic Operation – The polymer can be expanded to 4 times its un-activated volume, and then contracted to the original volume multiple times. > Controllability – The activation of the polymer is easily modulated by controlling the energy into or out of the polymer environment, producing a very precise rate of expansion or contraction. The rate of expansion or contraction can range from micrometers to centimeters per hour. > Precision – A very precise rate of expansion or contraction can be achieved. The activation of the polymer is easily modulated by controlling the energy into or out of the polymer environment, achieving such precision. 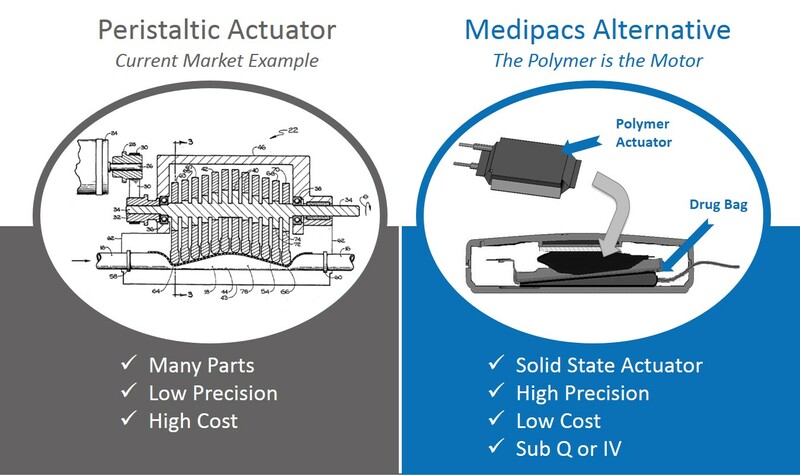 Presently, the Medipacs® polymer has been utilized as a solid state actuator in two infusion pump implementations. > Prototype pumps have been designed to deliver a fluid bolus. The bolus volume is programmable for a range from 10 micro liters to a milliliter per bolus where the largest bolus was delivered in about 5 minutes. Able to dispense contents in boluses of fluid ranging in size between uL and mL and greater volume range. > Another pump implementation delivers a continuous flow of fluid with rates of 2 to 4 milliliters over a 24-hour period and is the platform for the Medipacs® Mini-Infuser™ CRI Pump for use in animals. Let’s compare the Medipacs® alternative to the current market model. The Medipacs® novel polymer technology creates an opportunity to provide a low-cost, precise, wearable, disposable infusion pump. This platform is configurable for a broad variety of delivery solutions for injectable drug therapies.